Representatives from the organisations who have come together to create Get Torfaen Online (including Communities 2.0 Melin homes and Bron Afon Community Housing) officially launched the campaign which aims to help residents in Torfaen get the most from technology. The launch was opened by a speech from Communities 2.0 Project Director Cathryn Marcus who introduced AM for Torfaen Lynne Neagle. The AM talked about the importance of digital inclusion in Torfaen in particular, where she said around a third of residents are not online and one of the least digitally included counties in Wales. She also said that digital inclusion is now not just a technological issue but also a “social justice issue”. The latest Communities 2.0 digital inclusion regional initiative to be launched, the event was well attended with beneficiaries of the Get Torfaen Online partner organisations and stakeholders from the area viewing videos and hearing more about future plans to get Torfaen residents active online. Lukasz Kuziow of Bron Afon Community Housing delivered a presentation about the organisation’s Digital Deal and their future plans to create a network of accessible kiosks for easy and secure access to the internet across different locations. Attendees were also given a sneak peek at Torfaen Borough Council’s new app service which allows residents of the area to contact the council and report problems or receive answers to their questions quickly and in a more cost effective manner for the council. Melin Homes and Communities First provided video interviews of digital learners in the Torfaen area to show the human stories and the real life benefits that result from learning digital skills. New digital inclusion initiative Get Bridgend Online will help people to use online services such as Universal Jobsmatch and access the other benefits of being online. Carwyn Jones, AM for Bridgend, will launch Get Bridgend Online at Pyle Life Centre on Friday 6th December. Mr Jones will also present a series of awards to volunteers and digital inclusion champions which recognise the impact they make in helping people to get online in the Bridgend borough. The Get Bridgend Online initiative is a partnership between housing provider Valleys to Coast, Bridgend County Borough Council, the Local Service Board and The Creation Group. The initiative is supported by the Welsh Government’s Communities 2.0 digital inclusion programme, which is partly funded by the European Regional Development Fund. The Get Bridgend Online initiative brings a co-ordinated approach to digital inclusion delivery that meets the needs of digitally excluded people in Bridgend. Communities 2.0 regional digital inclusion initiatives such as this one aim to support individuals affected by the UK Government’s digital by default approach to Welfare Reform. This approach now means that job seekers have to search for posts using the Universal Jobsmatch system which is only available online. Training for frontline staff to support digitally excluded users of their services to access job search and Universal Credit. Direct support for digitally excluded individuals in Bridgend. Training and support facilities have been made available through a network of IT venues such as libraries and community centres. Engagement of social housing tenants, older people, unemployed people and disabled people with the technology appropriate and relevant to their lives. The initiative also includes a volunteer element that recruits and supports or Digital Champions to work within the community and support delivery at libraries, community centres and job clubs. It is estimated that the initiative will work with approximately 1720 direct beneficiaries and up to 800 indirect beneficiaries. It will recruit 20 volunteers and train 80 frontline staff. “I welcome the Get Bridgend Online initiative as it is becoming more important than ever for people to be digitally active, especially jobseekers and people living in poorer areas who could otherwise find themselves at a disadvantage. “Valleys To Coast and The Creation Group see how digital exclusion can effect our communities on a daily basis. Our support means that clients who are often intimidated by the idea of getting online are able to learn how to access the benefits they are entitled to and increase their employability within the workforce. By offering them support to get online we can help them to help themselves”. The launch event will feature a series of awards presented to individuals who have already made a difference to the delivery of digital inclusion in the area. Communities 2.0 is a Welsh Government programme and is part of the Delivering a Digital Wales strategy. Communities 2.0 is delivered by four partner organisations – the Wales Co-operative Centre, Pembrokeshire Association of Voluntary Services, Carmarthenshire County Council and the George Ewart Evans Centre for Storytelling (University of South Wales). Communities 2.0 works in the Convergence area of Wales and parts of Wrexham, Flintshire and Powys, helping communities and small enterprises to make the most of the internet. Valleys To Coast Housing (V2C) operates in the County of Bridgend, with a stock of some 5,800 houses and a small portfolio of retail premises. It was the first housing association in Wales to be established as a result of a large scale voluntary transfer of social housing ownership by a local authority, supported by tenants. V2C is an Industrial and Provident Society with Charitable Rules, operating as a social enterprise which invests in both people and communities. Last week, the Welsh Government published their Framework for Action on Independent Living which sets out an approach to public service provision that supports disabled people to live their own lives in the way that they choose for themselves. The framework includes actions to ensure access to good quality and accessible information and advice. One of the key actions identified by the Welsh Government is increasing the number of disabled people that are able to use the internet via the Communities 2.0 digital inclusion programme. 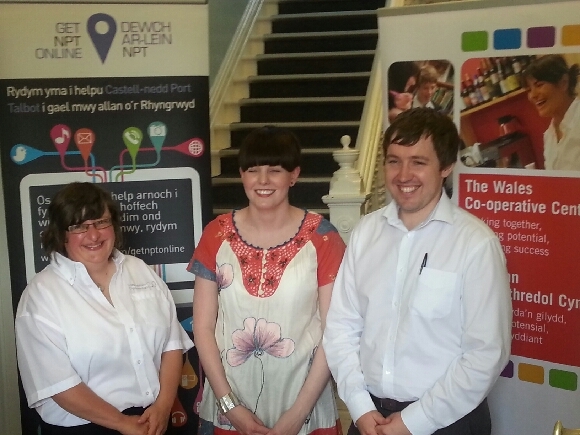 The Wales Co-operative Centre is the lead organisation delivering the Welsh Government funded Communities 2.0 project. 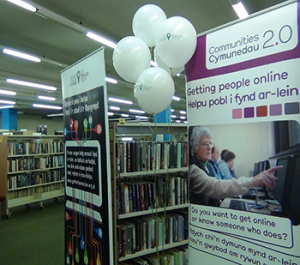 Communities 2.0 is supporting a number of digital inclusion initiatives aimed at disabled people, in partnership with organisations including Disability Wales, RNIB, Leonard Cheshire and the Digital Accessibility Centre. The framework outlines how Communities 2.0 will also continue to facilitate an ‘e-accessibility forum’, led by Disability Wales. The Wales e-Accessibility Forum is a group of representatives from organisations that support disabled people, with the purpose of finding ways to support disabled people to take advantage of the benefits of digital technology and the internet. We see digital inclusion as an essential thread to supporting independent living. In addition to the actions outlined in the Framework, we believe that access to ICT could enable disabled people to live independently in a number of ways. We welcome the support for the important work of the Communities 2.0 project and believe that digital inclusion can have a real impact on the lives of disabled people wanting to live independently at home, in the work place, in public places and socially in their community. Congratulations to Get Neath Port Talbot Online, the latest strategic initiative from the Welsh Government’s Communities 2.0 programme, which is led by the Wales Co-operative Centre. Get NPT Online was launched by Minister for Communities and Tackling Poverty, Jeff Cuthbert at Briton Ferry library this week. Jeff Cuthbert, Minister for Communities and Tackling Poverty, at the launch with members of the Briton Ferry Photographic Club. Designed to tackle poverty by overcoming barriers to work, the initiative has challenging targets for helping people become confident in using computers, and in finding work online. Through the Communities 2.0 programme, Wales Co-operative Centre staff have brokered a partnership between NPT Homes, Coastal Housing and the local Communities First organisation, to target support at those in greatest need. Front line staff of all the partner organisations will be trained to help their clients take the first steps towards getting online. This will be backed up by focussed training and support from a team of volunteers. People who were previously excluded from job opportunities through lack of skills will set up their own e-mail addresses, develop online CVs and learn how to search job sites. As a result, they will become included as part of the modern world. Katy, Rachel and Kevin – the Get NPT Online Outreach Team. The beauty of Get NPT Online is that it is a genuinely local response to the problems of poverty, worklessness and social exclusion. It works with the community, not on it. Get NPT Online is sustainable, because digital inclusion will be embedded in the working practices of the partner organisations. Across Wales, the Wales Co-operative Centre is delivering programmes in communities that have a tangible economic benefit. Thanks to funding from the Welsh Government and European Regional Development Fund, people in Neath Port Talbot have a head start. The Wales Co-operative Centre Marketing Team has been visiting Digital Day events today, helping to capture a day in the life of digital learning in Wales. I’d never been to Risca before, let alone the town’s library. Situated next to the former Risca Palace cinema, the library, which was only opened 18 months ago, still had that ‘new smell’ about it. It looked pretty plush inside, a nice layout, plenty of computers and a welcoming, friendly atmosphere. 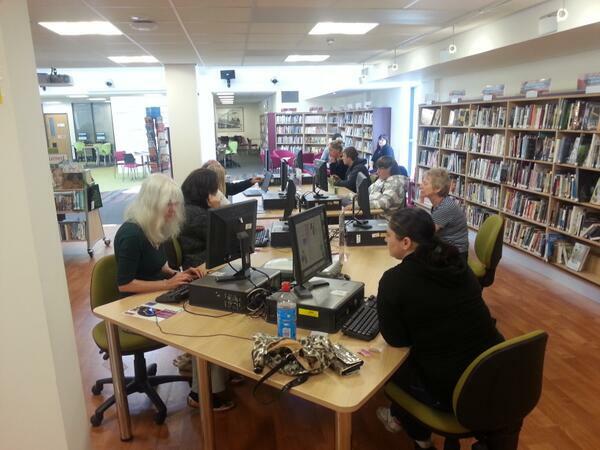 A busy Digital Day at Risca Library! I made my way to the first floor, where Communities 2.0’s Rachael Davies was overseeing a drop-in session. This is nothing new for libraries in Caerphilly Borough, as the Get Caerphilly Online partnership has been running Digital Fridays since last Christmas. What was different today – Digital Day – is that drop-in sessions were taking place, simultaneously, in 17 different libraries! Quite an achievement. 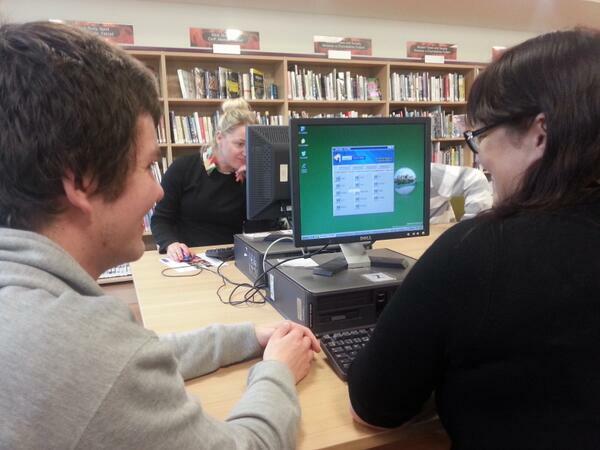 Back at Risca, while Rachael was showing a learner called Kyle how to create an e-mail account, two volunteer tutors – Aled and Kelly – were also busy. Aled was assisting Kathryn to sort out her spam filter on e-mail, find her CV and to search for jobs on Universal Jobmatch. 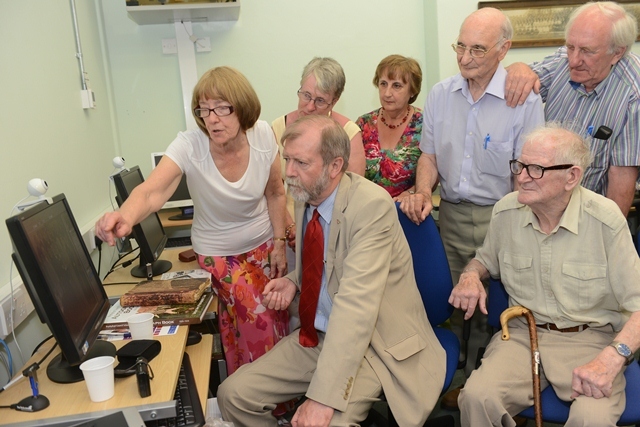 Kelly was sat with a very enthusiastic group, showing them everything from Google Street View to Historypin. Two of Kelly’s learners, Terry and Jill, said how much they enjoyed the social aspect of getting online in the library, as they could go to sessions as a group of friends, while meeting new people along the way. Both Kelly and Aled said how important it was that they were able to help people to increase their skills as they look for work – a key issue at the moment, with the Universal Credit to be accessed online in the near future, while the Universal Jobmatch helps people find work. The session was a busy one, with people coming going as they pleased. The range of people’s questions meant that Rachael, Kelly and Aled needed to be on their toes and ready to help people with whatever query they could throw at them. It’s a real skill to be able to draw on that knowledge and impart it in such a way that people can understand, are not concerned about trying something new online and, more importantly, want to learn more. I was really impressed with what I saw at Risca Library and it’s due, in no small part, to the partnership arrangement that has been put in place through Get Caerphilly Online. Well done to all involved.